Groceries are one of those things that can add up to a big bill really fast. Use these tips to cut your spending and make sure you keep your pantry stocked, even on a tight budget. Buy generic. Store-brand and “off-brand” foods can save you a lot of money, and are often just as good as the pricier name brands. If you’re not sure how something will taste, buy one new generic each time you shop, so you can learn which ones are good, and which ones are just cheap. Use coupons. Check your local paper for coupons, and go online to manufactured websites to find coupons that will save you money on the name brand items you buy. Some stores will also put out double coupons, that will increase the savings on these name brand products. Look for sales. Keep your eyes peeled for sales in your local stores. If you can, wait to buy certain foods until they are on sale, so you can get the best price. Try different stores. You may have a favorite place to shop, but if there is another store with equal quality and lower prices, it could be worth switching stores. You may also decide to shop at more than one place. For example, if Store B has better produce at better prices than Store A, do most of your shopping with A, and grab your produce at B. Make a list. Having a grocery list written up before you shop will help keep you from buying impulse items, or buying things you already have at home. You can make your grocery list better by having a meal list. Think about what meals you want to make, and write down the ingredients. Try to come up with meals that can share ingredients so you save money. Shop once a month. If you can, do one big shopping trip a month instead of several small ones. It reduces impulse buys, saves gas, and saves money. Buy in bulk. 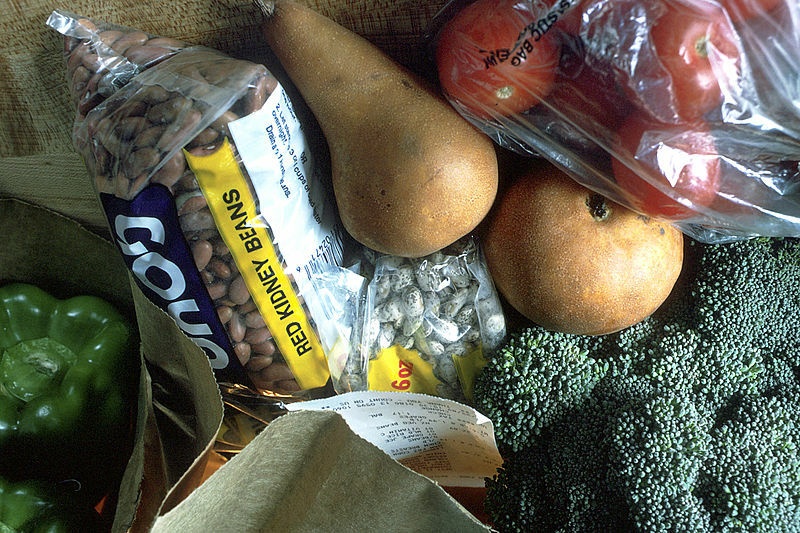 If there are foods you eat often, try buying bulk sizes to get a lower per-unit price. Never shop hungry. If you eat before you go out shopping, you’re less likely to buy impulse items, and quick foods that appeal to your growling belly. Plan home-made meals. You can save a lot of money by cooking real meals and freezing leftovers for later. It also gives you more control over what goes into your food and your body.